If Only Singaporeans Stopped to Think: GPConnect IT glitch: Who is legally responsible if patient overdoses due to wrongly labelled medicine? GPConnect IT glitch: Who is legally responsible if patient overdoses due to wrongly labelled medicine? I refer to the report on mislabelled medicine (800 patients given mislabelled drug dosages, double the earlier estimate; Sept 6). According to the report, labelling mistakes occurred on Sept 1. When a doctor complained about the glitch, the system operator told him it was his clinic's fault for not checking. Integrated Health Information Systems (IHiS), the government IT company that runs GPConnect, eventually admitted the error and informed most of the affected clinics by Sept 2. By then, more than 800 patients were affected. IHiS is the company that will eventually run the National Electronic Health Records (NEHR) system, when it is enacted into law. IHiS should take this mistake seriously and make adjustments for the future. First, prompt action can only be taken if IHiS takes all feedback and complaints from clinics seriously. Dismissing a complaint from a clinic will lead to the propagation of an error. Second, rather than waiting for clinics to point out errors, IHiS should do regular audits on their programs to discover unknown bugs. Third, the Ministry of Health (MOH) ought to spell out the legal responsibilities of all parties involved in the NEHR. If a patient overdoses on medication due to a software error like this, the patient could take legal action against the clinic for negligence. Will IHiS or MOH shoulder part of the blame if the primary error occurs due to IHiS? Also, if affected clinics have to call all their patients and inform them of errors, will IHiS provide resources like manpower to help with the process? Last, no clinic management system, including NEHR, is flawless. Clinic staff, medical doctors, pharmacists and patients should all be vigilant about potential mistakes. Important documents like prescriptions, medical certificates and medicine labels should be manually checked too. We refer to the letters by Dr Yik Keng Yeong, Dr Desmond Wai and Mr Chen Kok Kiong (Should Singaporeans worry about electronic health systems?, 10 Sept; Who is legally responsible if patient overdoses due to mislabelling?, Sept 11; and IHiS needs to explain how drug dosage error occurred, Sept 14; respectively). As a result of a system upgrade for GPConnect that was implemented on Sept 1, some clinics using GPConnect encountered problems where medication labels were printed wrongly. We investigated the incident upon being notified of the issue, informed all affected clinics of the incident from Sept 2 and provided support. We have been monitoring the situation and there have been no further issues identified since Sept 3. Patient safety is our priority, as is the case for our GPConnect clinics providing patient care. We apologise for the error. Initial investigation showed that the vendor made some changes which were unrelated to the upgrade, hence the user acceptance tests which were designed to evaluate the upgrade were unable to pick up on the error. The vendor also did not report any errors from other tests. Investigations are still ongoing. We will review and strengthen the testing procedure to prevent such errors. We will also step up monitoring of software roll-outs and enhance our response to support our users. A media report said that our staff had told a GPConnect clinic that "it was his clinic's fault for not checking". We have checked the correspondence. We wish to clarify that this statement was inaccurate. We take our responsibility very seriously and value the working relationship we have with all our partners, including clinics using GPConnect. We will continue to do our utmost to render all necessary support. The glitch in the GPConnect computer system saw more than 830 patients receive medicine labelled with the wrong dosage instructions. The cause of the IT glitch resulting in more than 830 patients receiving medicine labelled with wrong dosage instructions has been traced to an IT vendor for the GPConnect computer system, Senior Minister of State for Health Lam Pin Min revealed on Monday (Oct 1). Speaking in Parliament, he said investigations revealed that the IT vendor had made some changes to the application code for the system, which is run by public healthcare IT agency Integrated Health Information System (IHiS). The glitch followed a system upgrade by the vendor implemented on Sep 1, which saw some GP clinics having problems where medication labels were printed incorrectly. Dr Lam said, while the correct medication and total quantity of medication were correctly dispensed, the system printed the wrong unit of measurement on the label. Several clinics were aware of the error and manually corrected the dosage instruction on the label. Once notified, IHiS investigated the incident and informed all infected clinics from Sep 2, said Dr Lam. IHiS has been monitoring the situation, and no further errors have been reported since Sep 3, he added. “Affected patients were monitored by the clinics, and to date, there have not been any reports of adverse effects,” he said. Dr Lam explained that the changes made by the IT vendor to the application code resulted in the incorrect medication labels being printed. These changes were unrelated to the system upgrade. “Hence, the user acceptance tests designed to evaluate the upgrade did not pick up the error,” he said. “The vendor also did not report any errors from any other tests done. He said that since the incident, additional rounds of testing have been conducted to ensure that existing functions within GPConnect are working as designed. The unit of measurement function is also being enhanced to prevent future errors. In response to a supplementary question from MP Intan Azura Mokhtar, who suggested that new technologies or new security measures could be applied to ensure the security of such data, Dr Lam said that this particular incident was a result of human error, and there will be measures to ensure such errors can be picked up. However, he noted that MOH would “seriously look” into her suggestion on new technologies. More than 800 patients were affected by the glitch in the GPConnect software on Saturday, Sept 1 - more than double the initial estimate. Integrated Health Information Systems (IHiS), the government IT company that runs GPConnect, told The Straits Times on Monday that medicine dosage labels for about 400 patients from 83 clinics had been printed wrongly on Saturday. However, after doing further checks, it found that a total of 836 patients from 104 clinics had wrongly printed dosages on medicine they were prescribed. 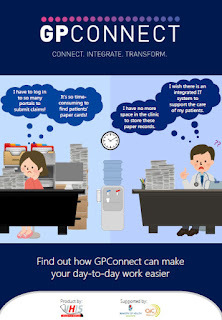 GPConnect is a system that provides general practice (GP) clinics with clinical and administrative support. It was launched early last year and more than 200 clinics have signed up for it, although only about 150 are currently using it. The IHiS spokesman said the glitch was caused by a planned system update. The company had informed most of the clinics affected by Sunday so they could call their patients to tell them of the error. She said some clinics had manually corrected the errors before giving the medicine to patients. The IHiS spokesman said: "As part of additional checks on the software issue regarding GPConnect, we have found that up to 836 patients who had visited 104 affected GP clinics from 7.30am on Sept 1 might have received labels with incorrect dosage information." Giving examples, she said that "Take 2ml 3 times a day" was printed as "Take 2 bottles 3 times a day", while some labels had incomplete dosage information such that "Take 1 tablet 3 times a day" was printed as "Take 1 3 times a day". She added: "The issue has been fully resolved." GP clinics are encouraged to sign up for GPConnect, or other compatible systems, ahead of the need for them to input patient data into the National Electronic Health Records (NEHR). The Healthcare Services Bill, which is expected to be enacted soon, will require all doctors and laboratories to input patient in-formation into NEHR unless the patient has opted out of the scheme. The NEHR, also managed by IHiS, provides patients' basic health information such as their medication so that they can be assessed by any doctor. This could be critical in emergency situations. IHiS was recently in the news over the cyber attack on the SingHealth computer system, in which the personal particulars of 1.5 million patients were stolen. One patient was told to take 10 bottles of cough mixture each time, instead of 10ml. Another had to take two strips, instead of two tablets. These were some of the mistakes 83 general practice (GP) clinics around the country faced on Saturday, when a glitch hit GPConnect, the computer system they were on. About 400 patients who had visited GP clinics from Saturday morning had received wrongly labelled medicine. 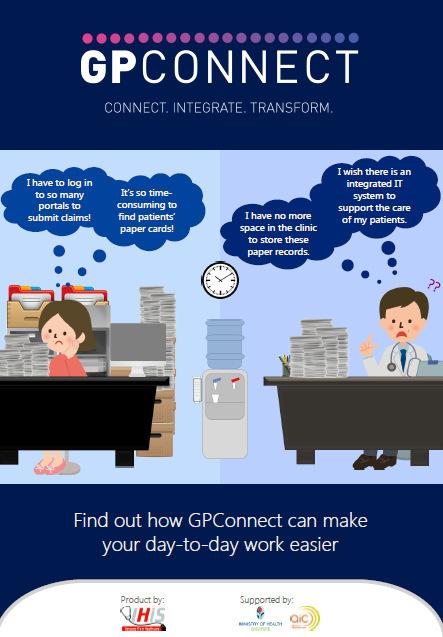 Launched early last year, GPConnect is a clinical and administrative system that allows GPs to submit patient data to the National Electronic Health Record (NEHR). It is run by Integrated Health Information Systems (IHiS), the government IT organisation that caters to medical practice. More than 200 clinics have signed up, but only about 150 are currently on it. An IHiS spokesman told The Straits Times that the problem on Saturday was caused by a planned system update. She said: "While the quantity of medication was correctly dispensed, the labels were incorrectly printed in some cases. "Patient safety is our priority. We take this incident very seriously and deeply apologise for the error." The problem - which changed the prescription unit, such as from ml to bottle - has been fixed and all the clinics had been told by Sunday. The clinics have been contacting affected patients to tell them of the error. She said IHiS is doing a thorough review to ensure it does not happen again. One doctor, who did not want to be named, said he was told of the glitch only on Sunday. He had to call patients up to tell them to ignore the instructions given with the medicine. He had signed on to GPConnect because of the requirement for all doctors to submit patient data online to the NEHR after the Healthcare Services Bill is enacted. But he said the system is not robust enough yet and his clinic has experienced different glitches since he joined last year. In March, GPs could not upload information for some hours, but they were able to use the system offline. When he complained about Saturday's glitch, the system operator told him it was his clinic's fault for not checking. He said: "We computerise so work is more efficient. We check on the computer and it is correct, so we expect the printout to also be correct." Another GP, Dr Choo Kay Wee of A Life Clinic at Novena Medical Centre, said GPConnect is better than some of the other systems he has used previously. He said the system is generally reliable, although there are occasional glitches. But his clinic checks everything so none of the mistakes reaches the patients. Dr Khaw May May of Killiney Medical Clinic agreed, saying that the clinic's receptionist would always check the labels before giving the medicine to patients so that errors can be detected. Dr Choo said: "It is a new system, so glitches are expected. The important thing is how fast they rectify the problem. IHiS has a team of very dedicated people."